Referee announced for Man Utd v Liverpool- LFC unbeaten in last two years under him! 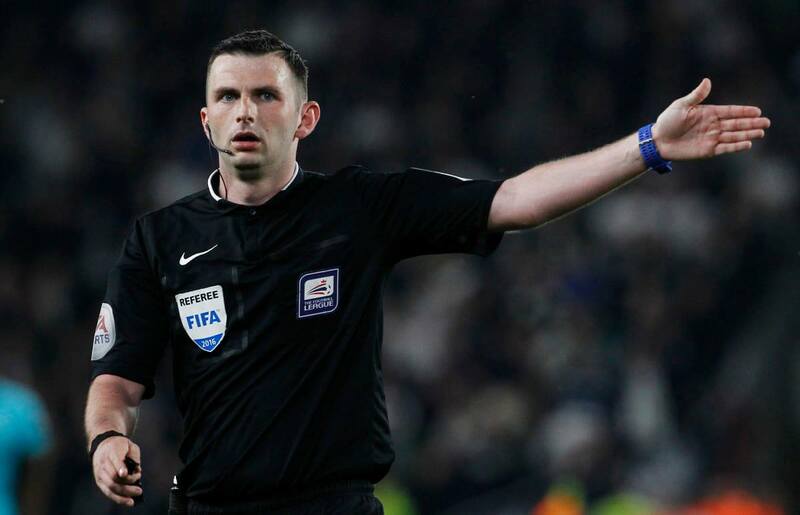 The referee for Round 27’s marquee clash between Ole Gunnar Solskjaer’s Manchester United and Jurgen Klopp’s Liverpool has been announced, and it’s Michael Oliver. The Reds have a very good recent record under him. Oliver last refereed a Liverpool game in December- the 5-1 win over Arsenal at Anfield. LFC are on a four game winning streak under him, and their last defeat with him in the middle came nearly two years ago, when Leicester beat them 3-1 at the end of the 2016/17 season. Manchester United were on a three game losing streak under Oliver before they halted it with a 5-1 thrashing of Cardiff before Christmas, also Solskjaer’s first game as Red Devils interim manager after taking over from Jose Mourinho. United have a win percentage of a little over 40% in Oliver games over the last decade or so. Their last win against a fellow top six side when Oliver was the ref came back in 2016. This is the first time since January 2017 that Oliver is taking charge of a game between these two great North West rivals. That last clash (at Old Trafford) ended in a 1-1 draw. This entry was posted in News on February 20, 2019 by lzozo. 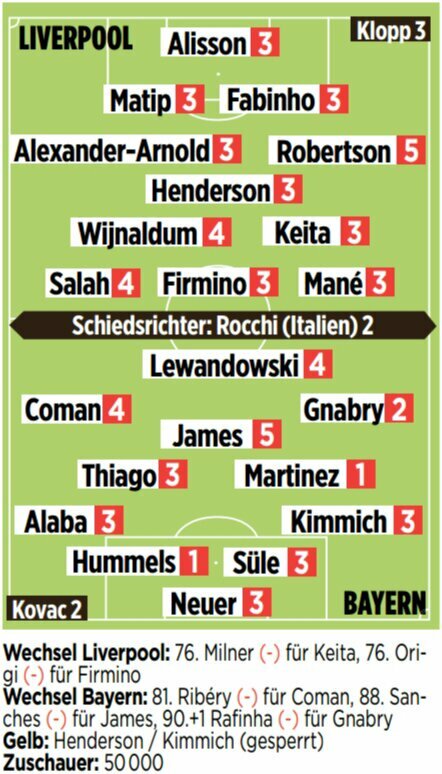 It’s always good to look at what the media in the opposition’s country think of our club’s performances, and without further ado, here is a look at Bild’s player ratings for Liverpool vs Bayern. Note that the player ratings are inverse- 5 actually means a a poor and 1 means very good. We were originally surprised to see Javi Martinez and Mat Hummels both get a 1, thinking that there was no way they had performed that badly, only to realise the grading system later! We thought Martinez was one of the stand outs for Bayern in what we saw, and were happy to see it proven right. According to these ratings, the worst Liverpool player on the evening was left back Andy Robertson, followed by Wijnaldum and Salah. There was no true stand out player, with several getting average 3 ratings- eight of the eleven were given that grade! Is it advantage Bayern Munich? Some would think so after the Bavarian giants came away with a 0-0 draw from Anfield following the first leg of their Round of 16 Champions League clash. Research suggests that the away team in the first leg (in this case Bayern) progresses nearly 75% of the time when the first leg ends in a 0-0 scoreline. However some would argue that Liverpool still hold an upper hand as they didn’t allow Niko Kovac’s men to score. This means an early goal at the Allianz for the Reds would leave Bayern chasing the game as a 1-1 draw would see Jurgen Klopp’s men progress on the away goals rule. Klopp himself declared in his post match interview that he “was not over the moon” but “was completely OK” with the result. Indeed things started brightly, but there was precious little of football played in the second half. The biggest talking points would perhaps be the Bayern fans’ banner protesting the exorbitant prices of away CL tickets, and Joshua Kimmich getting himself carded for a needless challenge on Sadio Mane, which sees the former out of the return leg in Munich. This entry was posted in News on February 19, 2019 by lzozo. Liverpool’s central defenders against Bayern likely to be Fabinho and Matip? 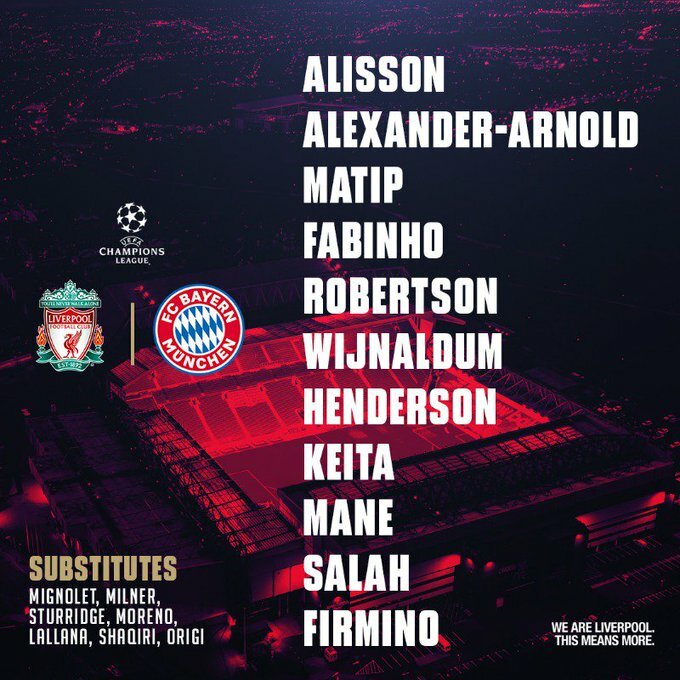 Liverpool may be forced to use a makeshift pairing of Fabinho and Joel Matip in central defence for the first leg of their crunch European knockout tie against Bayern Munich. 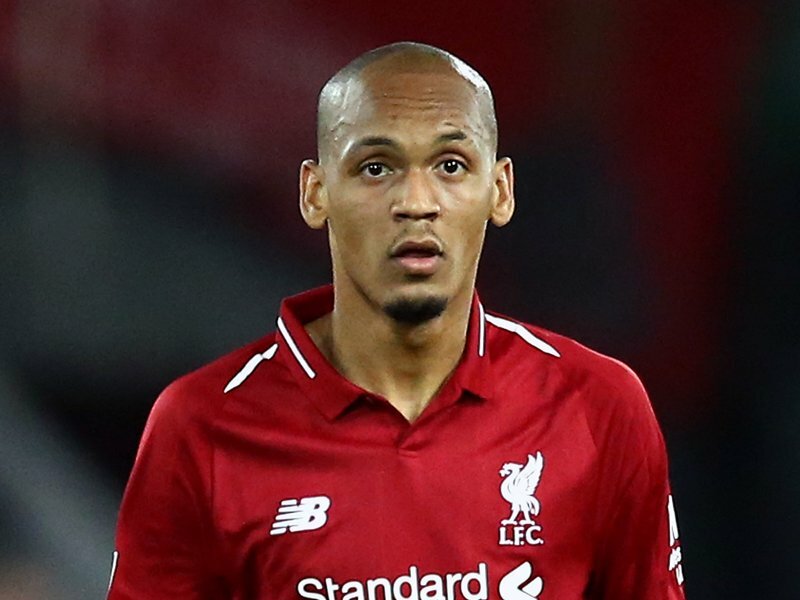 With Virgil van Dijk suspended, Joe Gomez injured and Dejan Lovren facing a race against time to be fit for this game, it looks like Jurgen Klopp will have to ask Fabinho to shift from midfield to CB alongside Joel Matip. How could this affect Liverpool’s chances? Bayern have one of the best attackers in the world upfront in the form of Robert Lewandowski. While the Bavarians haven’t been their all conquering self in Germany this season, they come into this game on the back of a 3-2 win over Augsburg last weekend. England had mixed success in the CL last week- Manchester United put in a limp performance at home against Paris SG while Spurs put in an assured one at Wembley against Borussia Dortmund. Liverpool have had a ten day break for this clash, with no fixtures scheduled for the weekend of February 16-17 for the Reds. This entry was posted in News and tagged Bayern Munich on February 18, 2019 by lzozo. Gini Wijnaldum scored an outrageous goal in Liverpool’s 3-0 win over Bournemouth at Anfield, and the Dutch midfielder finds himself in various pundits’ Team of the Week for GW 26. The victory was an important one for Liverpool after successive draws against Leicester and West Ham for Jurgen Klopp’s men had allowed Man City to go back on top ahead of the weekend. Wijnaldum’s goal came in the 34th minute of the game, sandwiched between Mo Salah’s 24th minute effort and Roberto Firmio’s 48th minute strike. He played 77 minutes of this game before being replaced by Trent Alexander Arnold. In both Robbie Savage and Jamie Redknapp’s Teams of the Week, Wijnaldum is the solitary Liverpool representative. In Garth Crooks’ Team, he also has Firmino and left back Andy Robertson for company. The next task for Wijnaldum and Liverpool is a tough CL Round of 16 clash against Bayern. This entry was posted in News and tagged Wijnaldum on February 12, 2019 by lzozo. A look at where the club’s players have come from in recent years! Following Liverpool’s 3-0 win over Bournemouth over the weekend, the club now have a ten day break until their next assignment- a tasty Champions League clash against German giants Bayern Munich. The midweek fixture against the Bavarians is followed by another tough one against Manchester United at Old Trafford. This entry was posted in News on February 12, 2019 by lzozo.